FROM the NORTH, WEST or EAST: Take Hwy-70 and exit SR213 heading to the base. Once you arrive and enter the gate, continue straight on Headquarters Avenue. Stay straight about 1/4 a mile and you will pass the headquarters building on the right with the flag pole, turn right immediately after the building, this will be Aberdeen. Go about 1 mile and you will come to a stop sign, turn left. Take the second left by the playground and you will see the spots on your left. Pull into a spot and walk to your 2 o’clock to register at Outdoor Recreation. ---- FROM the SOUTH: NOTE: The following directions are ONLY for vehicles with occupants with a valid Military ID. From El Paso, take US-54 North for about 10 miles. Take the Martin Luther King exit (some maps call it the Gateway Blvd exit). Turn left onto Martin Luther King (some maps show it as Kenworthy St or War Hwy). Continue North across the TX/NM border and the road changes to SR-213. You'll enter the WSMR back gate on SR-213. Continue past the base gate for about another 25 miles. Turn left onto Aberdeen Ave, which is before the the Headquarters Building (#100 w/Flag Pole). Go about 1 mile and you will come to a stop sign, turn left. Take the second left by the playground and you will see the spots on your left. Pull into a spot and walk to your 2 o’clock to register at Outdoor Recreation. ---- Check-in is at the Outdoor Recreation, Bldg. 1388. This is within walking distance across the field to the south of the campground. You'll see the RV storage lot next to the building across the field. 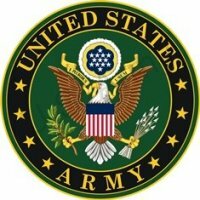 Active, National Guard, Reservists, Retired, 100% DAV. DoD Civilians. Contractors residing or working on the installation. Accepted at least 30 days in advance. None at the RV Park. WiFi is available at the Bowling alley and at the Army Community Services. Pets allowed with usual leash and clean-up rules. Must have current vaccination records. Maximum stay is 21 days out of 60. Extensions are possible. Tours to Trinity Site, location of first nuclear explosion, are conducted on the first Saturday in April and October. Contact (575) 678-1134/1135/1700 for arrangements. If you have a reservation, you can go to your site first, then return to Outdoor Recreation to check-in. Firearms are allowed on the installation, but MUST be declared upon arrival at the gate. Firearms must also remain unloaded and remain inside of your vehicle. Not much more to add from the previous reviews. Nice, quiet location for a great price. 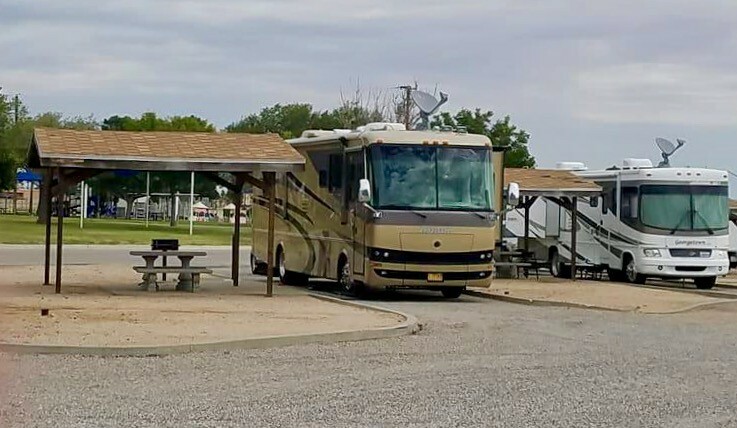 We made reservations, but the RV Park was only 50% occupied for this week. However, they will be full next week for the Battan March annual event. This time of the year, the winds came up VERY strong, but we had some very nice days as well. 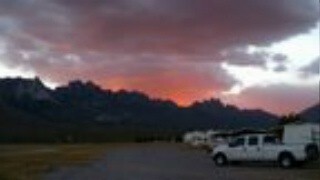 I prefer this campground over the Holloman AFB FamCamp. 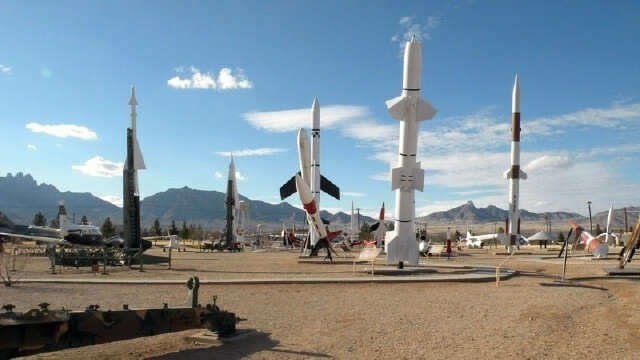 The missile museum is a MUST see. We greatly enjoyed our relaxing short time here. 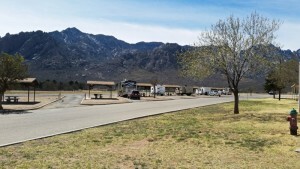 RV campground with 10 sites, they take reservations ahead. For $10 a day this FHU campground cannot be beat. 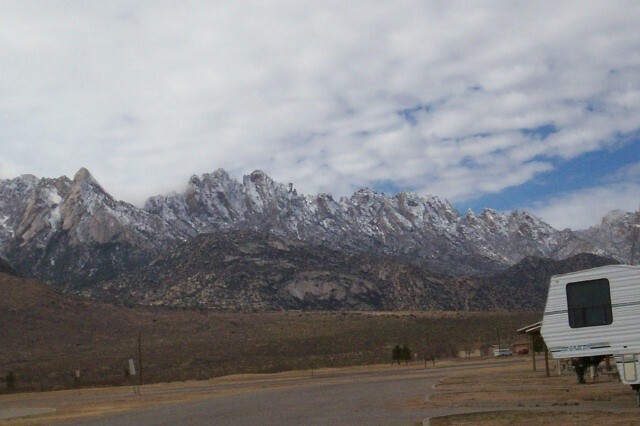 It is located on a small base in the middle of the Organ Mountains. 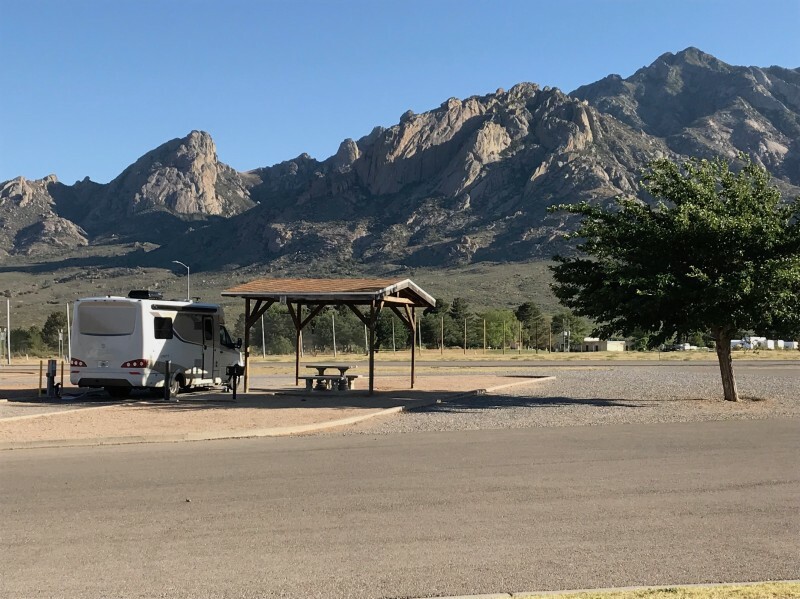 With Las Cruces and White Sands National Monument approximately 30 minutes away there is plenty of things to do in the area. The Commissary is closed Mondays but there is a 7 day store (PX) open daily. 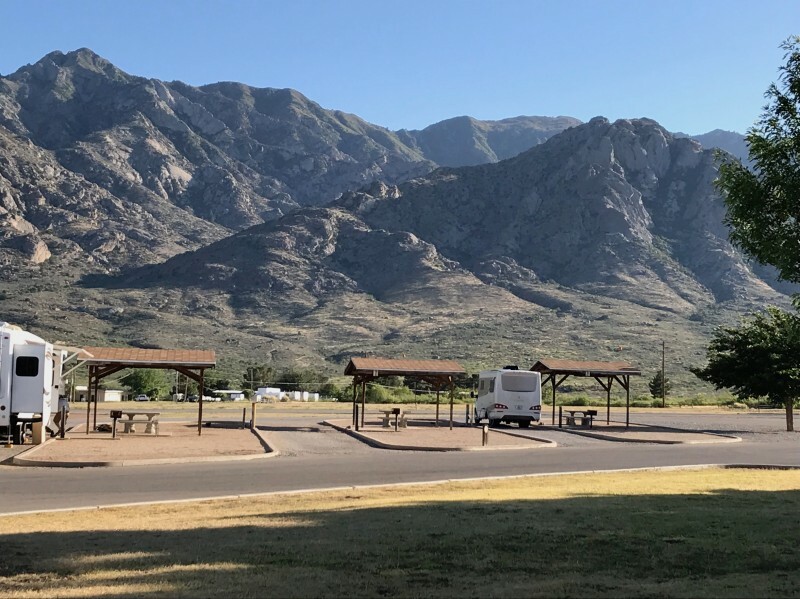 There is no internet offered at the campground but you can get WiFi from the Bell Gym, the library on post or the bowling alley. Fri- Sat there are free movies shown at the theater. There is a Post Office on post that will accept general delivery packages. Though it is still listed on the maps/apps/military campground listings the golf course on this base is closed and will not be reopening. 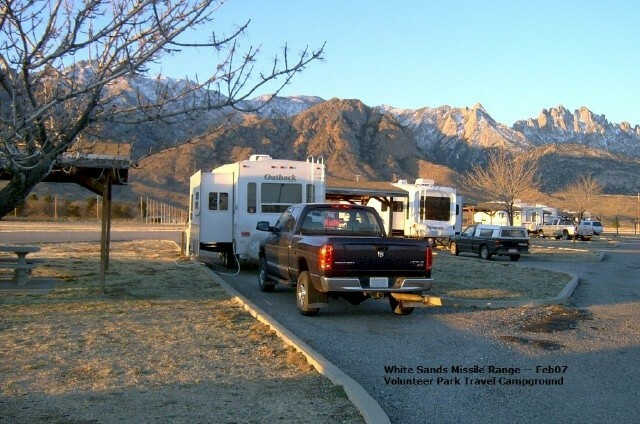 This is a great famcamp for anyone visiting White Sands National Monument as it just a short drive away. 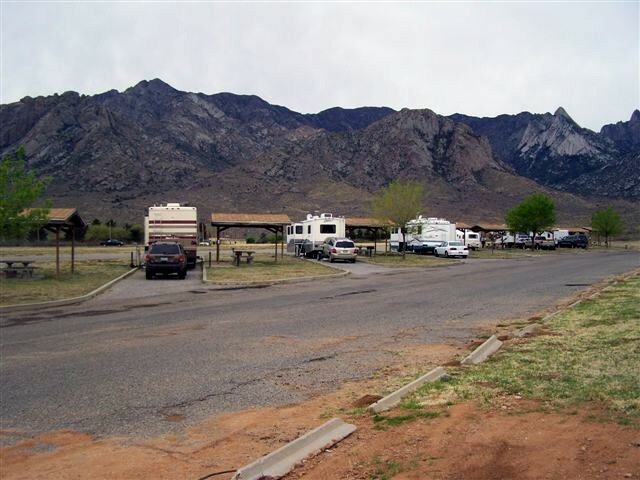 We called a few days before our arrival and made reservations with Todd at the Outdoor Rec Office which is located within walking distance, on the mountain of the campsites, just beyond the Golf Driving Range. When we arrived I called Todd and asked which site was ours, he said just pick one, there should be three available, however, there was only two, number 2 & 7. We selected 7. The sites are narrow with steel poles, the electrical pedestal, a covered pavilion and lighting too close to the sides, so we pulled far forward to assure clearance of our slides. Check-in with Todd was easy and he was friendly. 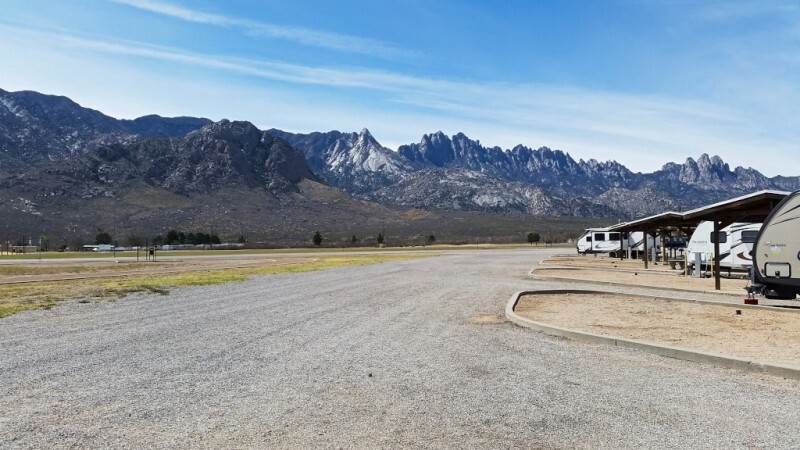 NOTE: Their reservation system seems a bit less than precise, as they allow folks to reserve a site, without knowing which site or how long you plan to stay. If a person shows up after hours and parks in a space, or if someone doesn't leave when they said they would, your site will be occupied when you show up on a Sunday or after hours without knowing who is on your site. They do have some electric only overflow sites available, which were occupied while we were there, however, site number 2 was never occupied. Commissary was well stocked and open on the weekends. The post museum was free and interesting. We very much enjoyed our stay. We arrived after driving 5 hours from Carlsbad. When we arrived at 1:30, all 8 spaces were occupied and no one was showing any interest in hitting the road! Especially frustrating as we had reserved our spots a month ago. We checked Outdoor recreation for any notes for Sunday check in and found nothing. Phone went to vm. No after hours contact info. I can’t wait to hear the excuse when I call tomorrow! Stayed at White Sands during this period. 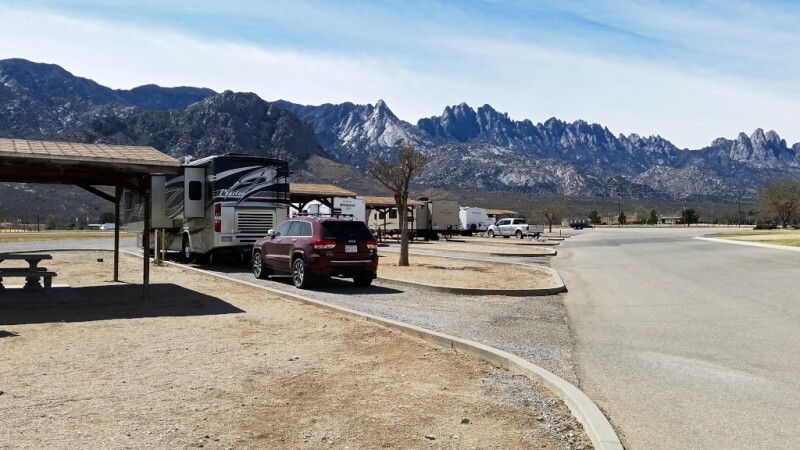 There are 8 full hookup spots looking right at the Organ Mountains. It is very beautiful and peaceful...quiet. The base was in a bit of a "down" time while we were there so limited hours on the commissary, etc. This base is pretty far from a lot of things but worth the drive. We also found services to be good as our tow car died and we had to have someone get on base to get it to a repair shop in Las Cruces. No problem. I was surprised as how quickly they got there and were able to get on post. The wrong address was on my notes for checking in to Outdoor rec, but they are within eyesight of the campground. It was very hot there in August but this was a great place to use to explore the area...a bit of a drive to things but that's New Mexico. The only wonky thing was the shower set up here. It was in a separate building a few steps from where the campers were parked but the shower was small, kinda creepy and not ventilated. I've been in much worse so no problem but be aware. I actually really loved staying here and would do it again. It was worth the drive to be in the area and to see White Sands. The fee, $10 a night for full hookups, can't be beat. The base of WSMR is in a very expansive and desolate desert, surrounded by numerous weapons test ranges. 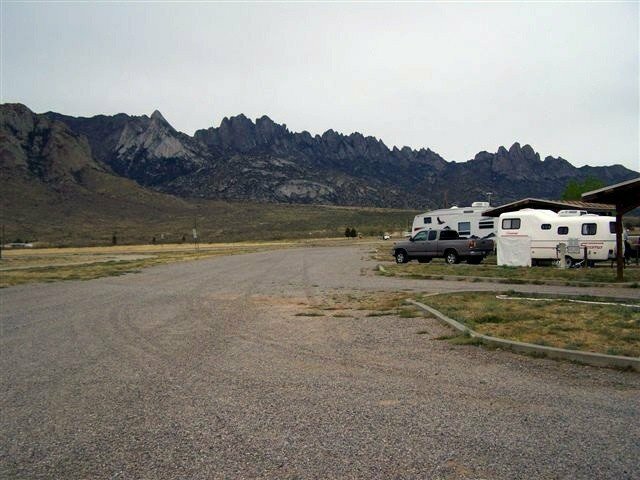 The small campground is very nice with great views of the mountain range. Excellent hookups well positioned. Concrete picnic pads have a large shelter covering providing some relief from the intense sun. Check-in was easy; Anthony at the Outdoor Rec office was very accommodating. The post has all basic amenities. The Frontier Club is convenient and serves a great breakfast and lunch. Grassy park across the street offers nice dog walk area. As others mention the bathhouse is old, dark and musty ( the shower is in a closet in the bathhouse with little ventilation) this is the only draw back of this facility, and certainly worth the $10/night fee. 8 sites of full hookup. 1st come,1st serve, we got in too late. We stayed on the street in overflow, electric 50 amp. It was fine for 2 nights. We went up to White Sands Missile Range because Fort Bliss was filled. We took the highway 213 from El Paso to the base. The road was nice 2 lane with wide shoulder the entire way. No problem going through the back gate. Check in at the MWR facility in the old golf pro shop was easy. $10 a night is unbelievable for a FHU facility. All 8 pads are pull through with 20/30/50a, water, sewer, grill, and shelter. 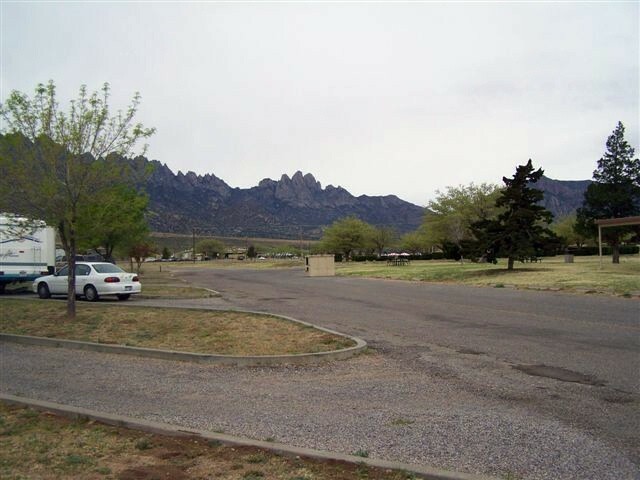 The scenery is awesome with the Organ Mountains right outside your door. We talk a bike ride down through the old golf course and it was really nice. The restrooms/showers are in the building next to the campground. They were acceptable, but that is about it, not really dirty but dark and old. We did laundry on post at the laundry mat. It was $1.50 wash and .25 for 8 minutes to dry ($1 per load for us). There was not much to do on-post. We went in to Las Cruces everyday. 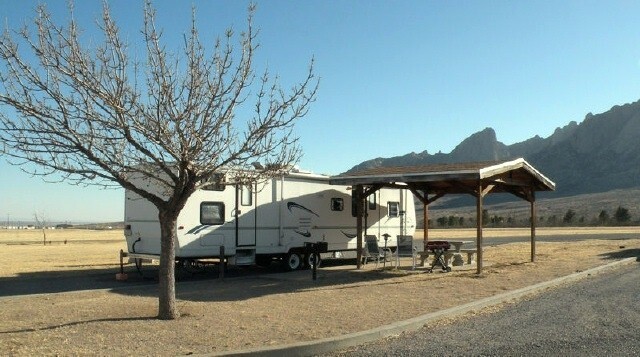 We really did enjoy Las Cruces, it is a nice town. If we were coming back into this area, I woul not hesitate to stay here again! Since the golf course has been closed, it's not as much "fun" as in my previous reviews! The facility is fine. We still enjoy our visits. The old golf pro shop is now the MWR facility and the check in place for the RV park. You can't miss it: pull into a site, look straight ahead & what you see is the MWR office. I believe the driving range is still available. We arrived on the 12th for a much needed time to relax; been on the road since 14 Sep. Checked in with MWR and found the famcamp almost empty. (Well, there are only 8 sites) The base area itself is not hard to maneuver and find your way around. 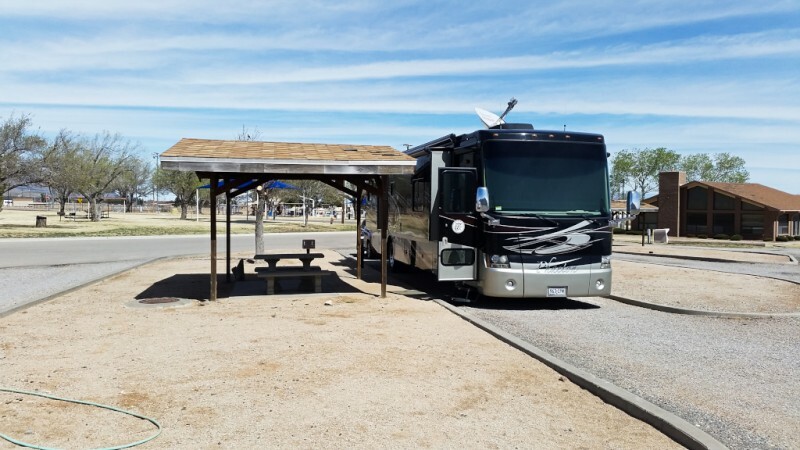 If you want to know about places to eat; ask your neighbor or give ACS a ring, they can give you directions/times to any place you need on the base; like the laundry facility. Restroom/Showers: Seriously old but clean. 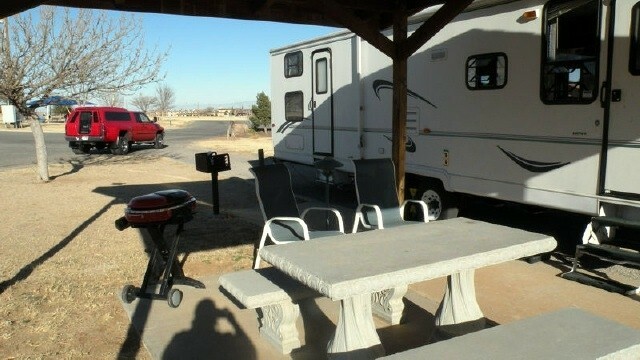 This is a small famcamp but it's clean, fresh and a hidden gem for the price! Love waking up and seeing these beautiful mountains outside our front window! 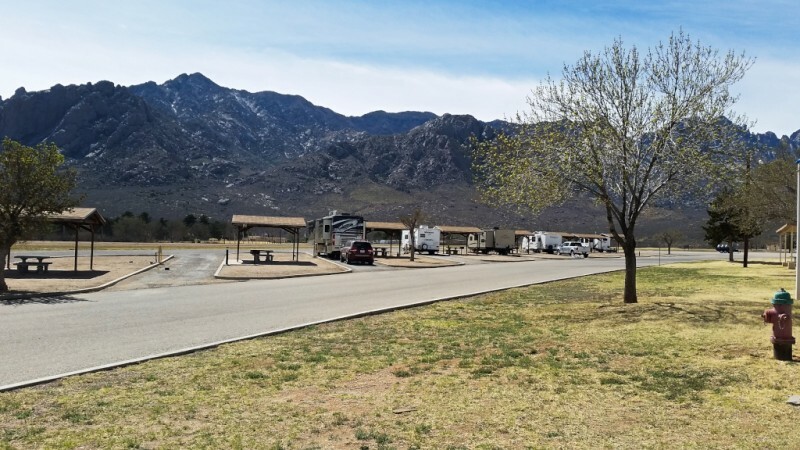 We arrived at WSMR in the early afternoon with a reservation. Clearing the main gate is no problem. The will ask if you have a firearm so if you carry one make sure it is unloaded and the ammo is separated from the weapon. 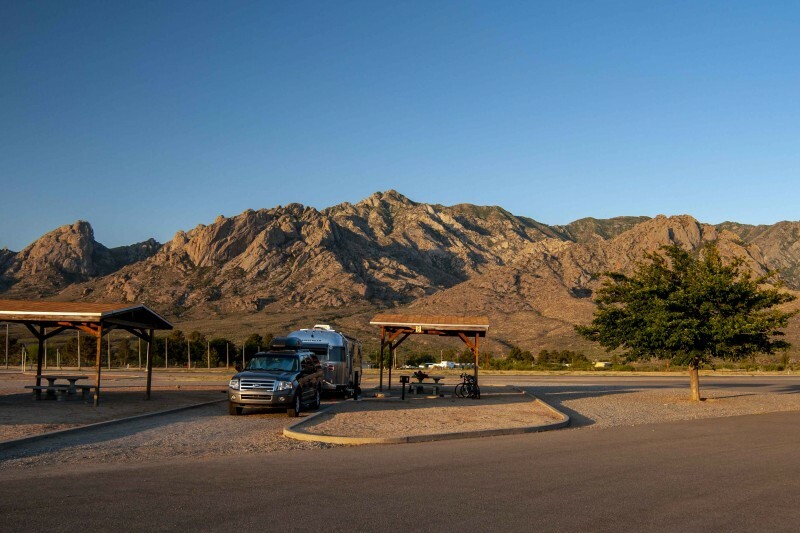 We were told by the attendant at Outdoor Recreation that it is not necessary to check in there before going to the campground if you have a reservation. 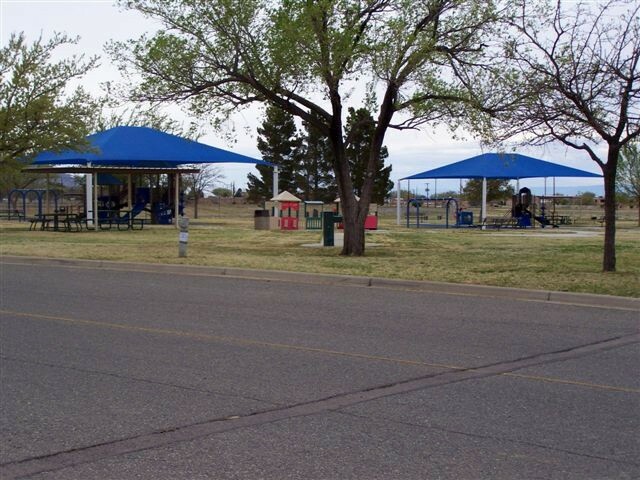 Go park in an open site then head over to the Recreation office and pay for your site. Yes, you have to do some maneuvering to get parked/leveled but it’s doable. Great DTV satellite signal from all sites. Just a fair Verizon 4g service. Good water pressure and solid 50 amp electrical service.You can’t beat the views of the mountains. 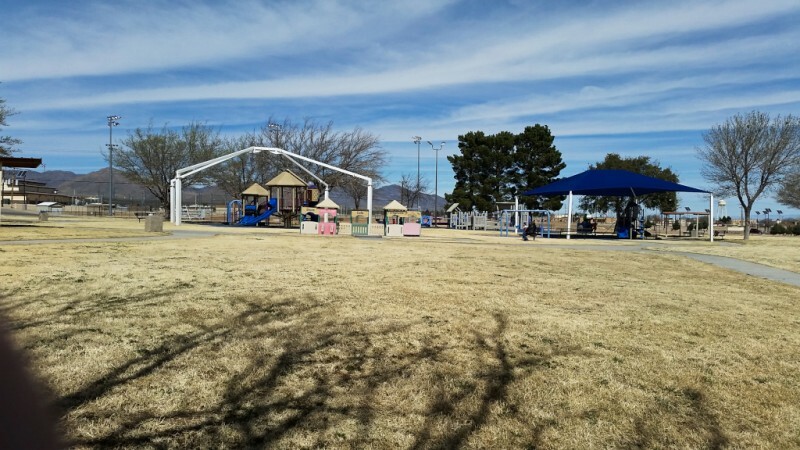 We were going to stay at Holloman but decided on this park dt ability to make reservations AND the description in our military book said there was a tour of the Trinity site twice a year. I based my trip to ABQ so that we would be here for the April 1st tour. On our trip west, I finally looked up info about the Trinity site and found that it was 3 hours away. So disappointing! But now I know and since our kids live in ABQ, I will have more chances to take the tour. 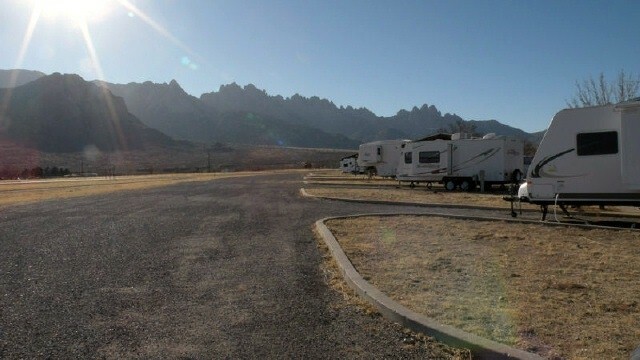 This is a lovely site with amazing views of the Organ mts. There is a pool and workout facility but the pool does not open until 11am on the weekends so could not take advantage of it. Walking the golf course is very nice. So sad that it is closed as we would have loved to play it. Maybe the expected increase in the military budget will allow it to reopen. Too bad that a few residents do not come together and form a membership fee that would cover the cost of operation. It is really a pretty course there at the foothills of the mountains. There is a bath house that is not in great shape but the single shower has both hot and cold handles (not those awful buttons that turn the water on for a minute or so, usually just long enough to begin to feel the warm water coming) and a strong stream. The best shower since we left home 12 days ago. An extended family was camping here for one of their members military retirement....so heartwarming! The wind was strong when we arrived but gentle the following day. We drove into Las Cruces on that Saturday and visited the Farmers Market. We took our dog and the place was very welcoming of dogs. People were super friendly and we talked with 4 different people from Maine in the area where we have a camp. Go figure. Plus while waiting for our burritos for lunch we started talking with the friendliest local couple and they gave us some good informationa about the area. We bought two vases from a retired navy yeoman...very nice, both the vases and retiree! Highly recommend a visit to the market if you are in the area on Saturdays. We enjoyed our stay here. 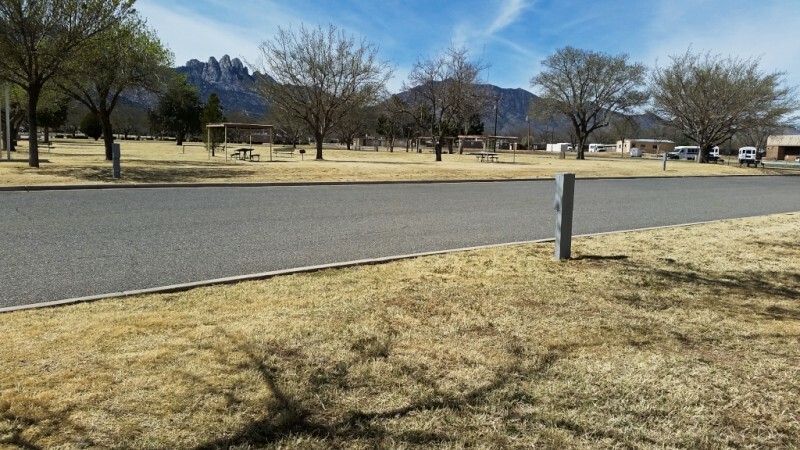 WSMR is quiet and relaxing place. Photos are still good. Called and reserved a site to make sure we had a spot when we arrived, employees are friendly, just could do better with knowing what sites are available. Only 4 of us there for the week. Only saw 1 maybe 2 long term occupants. Sites are all sloped backwards some and we needed to use 3" under the rear wheels to level MH. As previously stated you need to position carefully with electric and light pole right at edge, in order to open or clear the slides or basement doors. ATT 2-3 bars, wifi available at frontier club or IHG hotel with password. I was able to connect to frontier club with my wifi antenna and speed was OK. Small commissary and PX which is more like a shopette. On base fuel but no diesel. 2 mile walking track right by the campground. We enjoy the peace and quiet at base of mountains. Golf course permanently closed as of Nov 15, 2016. Frontier club serves breakfast 630-9 and lunch from 1130-1300 M-F reasonably priced and pretty good. No drop and hops that I saw. 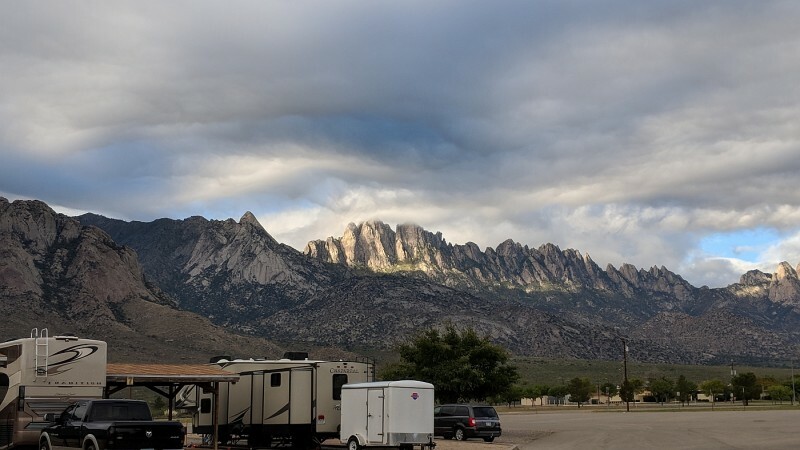 we have stayed at WSMR often and always enjoy the beauty and quiet surroundings. They have installed new electric pedestals and "night light" stanchions. It can cause some parking problems for rigs with slide-outs and short hookups. The pedestal and stanchion are directly opposite each other, toward the front of of the site, right on the edge of the site. This makes for a narrow space about a 1/3 of the way from the front of the site. Since we have 3 slides-out and basement doors, we either had to park towards the rear or the front of the site, not the middle. We parked near the rear since we have a 38' rig. This necessitates a long 50 amp cable (in our case) and long sewer hose, as the sewer connection has been moved next to the electric pedestal. A shorter rig could park near the front. 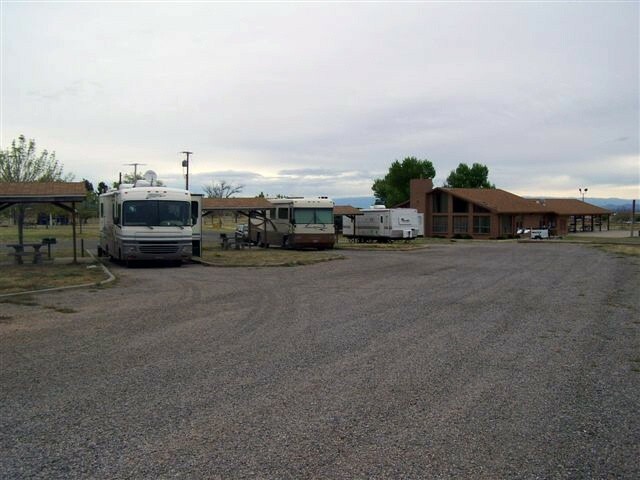 The saving grace is that these are some of the longest sites I've seen at a military RV camp. While it is not a well thought out placement of the pedestal and stanchion, in my opinion, one can certainly work around it! The MWR (outdoor rec.) mgr. is a super nice lady! We'll continue to use this facility many times a yr! This facility is very nice and quiet. 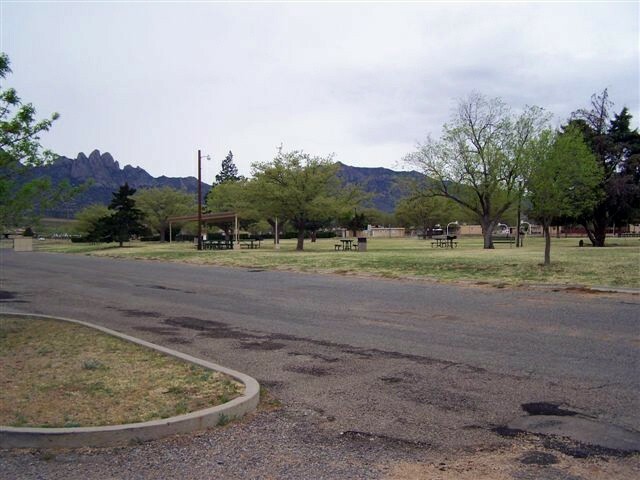 All in all a great location as long as you know what you are getting, distance from Las Cruces and Alamogordo. The check in process has a lot to be desired. It would have been nice to get a map of the installation, told where the dumpsters and recycle bins were located. The folks at Outdoor Rec were nice but just not very helpful. When asked about a map, I was told to go to the gift shop, they might have one. Also my reservation wasn't on the "board" but was still on someone's desk. Good thing I was the only person to show up on Sunday. Since I've been here and know the ropes I would go back. Maybe they could take some lessons from Agave Gulch on how to check someone into the park. Directions are good, photos are still current. Arrived on Sunday night there were four empty sites, one camper in overflow (15Amp on street). No signs or instruction to be found, office closed on weekends. We took an empty site and went to Outdoor Rec in morning to pay and stay another night. Outdoor Rec has a small amount of supplies, seemed to be unorganized to me. They did not have any available sites for another night had reservations coming in. Did not use the bathrooms or showers so can't rate. Rec room locked up. Cell phone good, wifi none. Nice little park, which is what we like, quiet place to stay. Suggest you make reservation before driving out. $10 a night full hookup.